Join Fondazione Italia for the annual CARNEVALE party! 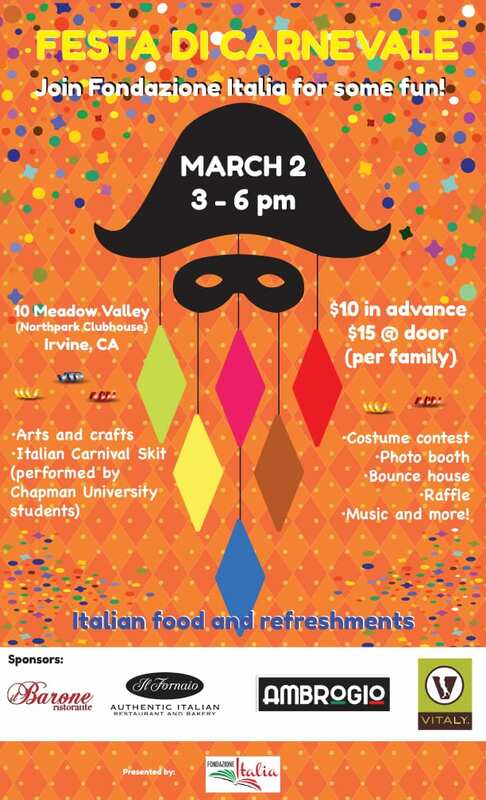 Join Fondazione Italia on Saturday, March 2nd, for our annual CARNEVALE party! Featuring a Commedia dell’Arte skit performed by Chapman Italian Studies students. Enjoy fine Italian food and special carnevale treats, a costume contest for children and adults, arts and crafts, a Venetian photo booth, story time, music and more! 10 Meadow Valley is a clubhouse located inside the beautiful gated community of Northpark. When you arrive, let the guard know that you are going to the Italian school party and head to the clubhouse at the center of the neighborhood. Street parking available.